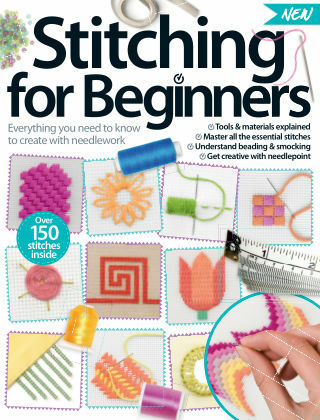 With Readly you can read Stitching For Beginners and thousands of other magazines on your tablet and smartphone. Get access to all with just one subscription. New releases and back issues – all included. Needlework has found new life for modern generations. Not simply a means of patching up worn-out fabrics, the humble needle and thread have opened up new possibilities for channelling your creativity. Master the basics by touring the stitcher’s toolbox and practising stitches used in embroidery, needlepoint, smocking, Florentine work and beading. Happy stitching! Featuring: Tools and materials - Know the ins and outs of all the stitching essentials, from needles and threads to hoops and frames. Surface embroidery - Your starting point for all things embroidery, from the bare essentials to more advanced stitches. Needlepoint designs - Learn to follow a needlepoint pattern or design your own creations from scratch. Smocking, beadwork and Florentine work - Embellish your textiles and fabrics using these decorative additions and details.